Cloud-first, mobile-first organizations are seeing huge benefits from taking a more distributed approach to IT. Business units are given more freedom to evaluate and select SaaS applications that will enable efficiency and growth. Users are given more freedom to use the devices that make them the most productive. When this trend started, most IT organizations were able to implement some basic, manual processes to administer and govern IT in this best-of-breed distributed environment. However, as the number of touchpoints increases, IT needs to automate to keep pace. 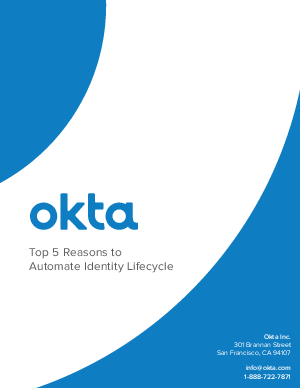 This paper goes into more detail on the top 5 reasons to automate identity lifecycle and identity administration and build a solid foundation for future cloud-first, mobile-first IT.